Last Friday Commissioner Jeff Tobolski hosted an annual event to honor all veterans. The event coincided with the coming of the Vietnam Moving Wall to Proksa Park in Berwyn. The Moving Wall is a half sized replica of the Vietnam Memorial and tours all over the country. Around 150 veterans from World War II, Korea, Vietnam, Iraq, and Afghanistan attended on Friday at the event held at the McCook Athletic Exposition Center. 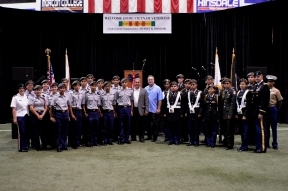 The Morton College JROTC presented the National Colors and also did a rifle demonstration. In attendance were Mayor Robert Lovero of Berwyn, Cook County Recorder of Deeds Karen Yarborough, and Cook County Director of Veterans Affairs Bill Browne.